In a side box outflow of a Cornell Dual Drain? If water is pulled off the top and side of the side box anyway, what is the advantage of having a stand pipe in the side box? 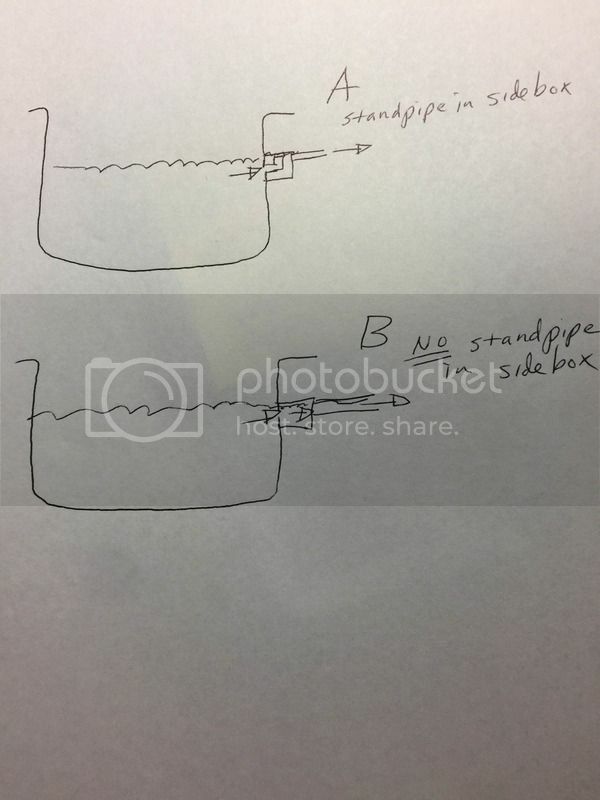 After doing a image Google search it appears the boxes with the standpipe have the standpipe extending vertically from the box to the floor where that flow is directed to some kind of filter. So a stand pipe may not be applicable to an overflow that leaves the box horizontally as mine will. Advantage of standpipe in control box is that you actually can change operation level in the tank by extending or reduction of this pipe; is easy. But how would that work if by reducing the water level in the tank -- by reducing the height of the standpipe -- you simply increase the flow back to the tank? It would seem you need an exit point for the water level dropping in the fish tank. Primary advantage to standpipe on all exits is that in case of any equipment failure which causes loss of water flow to the tank, you don't drain all the water from the tank. If you do a bottom drain with no standpipe, you could potentially drain your entire tank in a few hours if you had a pump failure or power loss. If you are 100% confident in your water flow into the tank, then you don't need to bother with it. My side drain and bottom drain seem to work as planned -- at least at this point -- before I get a good centripetal flow going (Don't want much water movement until the fry become larger). I have also found if I want to flush the bottom drain temporarily I can just close the side drain and open the bottom drain completely, and any solids near the bottom drain or in it, end on the parabolic screen! Good fry tanks have a high exchange rate but a low water velocity. This makes them susceptible for biofouling, this in combination with an incomplete developed immune system of the fry means frequent cleaning. However this doesn't have to take that long. btw I don't like flush drains on parabolic screens as they don't work very well under those conditions. Makes sense, but so far so good for me. Water is staying gin clear vs. my previous systems, and I am feeding up to 8 X per day fry powder. I also periodically remove any settleable solids in the bottom of the fish tank via a mag drive pump and pvc 3/4 inch wand, with the out take an RV hose (use only RV hoses now as others contain lead) as the hose to the floor drain. All I have to do is point and the solids are instantly gone without stirring them up. I do have two filters following the parabolic filter. Two 200 micron sock filters and a 30 gallon up flow sand filter after the sump tank that feeds back to the fish tank. I can easily backflush the sand filter by closing the overflow to the fish tank, and opening the discharge to the floor drain. Then hook up via a center pipe that comes up off of a lateral assembly under the grate, a shop vac on blow, and the two sizes of rock, gravel, and granite chicken grit gets churned up while any solids present are flushed. You should see the air churn things up! Once the water flows gin clear I shut the shop vac off and replace the fittings in to flow mode. Then I'm back in business. Previously with my garden fence netting in a drum with a u-tube siphon as the only mechanical filter, I had nothing but problems keeping the water clean when feeding fry. I know there are better ways but I either can't afford them or prefer to build myself. I have eliminated the center bottom drain pipe as a continuous flow. I'm convinced it's counteracted by the side flow drain and collects debris that could cause an increase in ammonia, nitrites, and hydrogen sulfide. When I disconnected it I got a foul odor and some debris. With problems with elevated ammonia and nitrites in the system, I thought it best to eliminate all possible causes. I am now pulling a knife gate valve on the bottom drain pipe twice a day to remove and debris in the pipe or around the drain. I consider a central bottom drain important for optimal water quality (much more so then the side drain). poop settling in a drain is a consequence of (too) low water velocity; you should increase flow or decrease drain/pipe size.